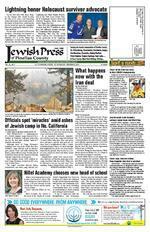 PRESORTED STANDARD U.S. POSTAGE PAIDThe Jewish Press Group of Tampa Bay, Inc.The Jewish Press Group of Tampa Bay, Inc. Jewish Press of Pinellas County P. O. Box 6970 Clearwater, FL 33758-6970 Just a nosh.. Just a nosh..Complied from JTA news service ADVERTISEMENT www.jewishpresspinellas.com VOL. 32, NO. 7 ST. PETERSBURG, FLORIDA OCTOBER 20 NOVEMBER 2, 2017 12 PAGES DO GOOD EVERYWHERE. FROM ANYWHERE. Join our page @ www.facebook.com/jfed.pinellas Meet Judy Benjamin, Did you know?president of the Philip Benjamin Tower Foundation and a Federation Lion of Judah. Judy feels that caring for our older adults is one of our greatest duties, and as this population dominates our area, shes proud to be a part of this Federation beneciary organization. The average age of our Jewish community is 62 and nearly 10% of our areas total households are comprised of single men over 65 years old. Hungry for more numbers? See Emilies column on page 3. rfntbb fnf The Jewish FederationOF PINELLAS & PASCO COUNTIES, FLf f Lightning honor Holocaust survivor advocateAfter a year-long national search Hillel Academy chooses new head of schoolBy RON KAMPEAS JTA news service What Trump wants What happens now with the Iran deal By ROB GLOSTER J. Jewish News of Northern California via JTA Ofcials spot miracles amid ashes of Jewish camp in No. CaliforniaSurrounded by blackened vegetation, Camp Newmans iconic hillside Star of David survived a Allison B. Oakes, Hillels new head of school.Photo URJ Camp Newman Facebook pageLIGHTNING continued on PAGE 5 IRAN DEAL continued on PAGE 11 MIRACLES continued on PAGE 11 HILLEL continued on PAGE 7Israeli driver Alon Day races to rst NASCAR championship ings in the auto racing groups European series, which ended Oct. 15 with a race in Belgium. The Israeli was fourth in the race he needed only to complete the title after being well ahead in The Times of Israel reported. professional race car driver, third in the European series standings the past two seasons. Day, 25, who grew up in Ashdod, began competing training on computer-screen simulators because Israel Jewish coach leads Colombia national soccer team into World CupBUENOS AIRES, Argentina Led by its Jewish soccer team will play in the 2018 World Cup in Russia. countryside, one of the main centers of Jewish immigration 2012 and led the nations return to the World Cup in 2014 following a 16-year absence from the world championship. In June 2016, he led Colombia to a third place in the prestigious Copa America, which was held in the record of 38 wins, 17 losses and 15 ties. ticipating in the FIFA World Cup for the second year in a row, albeit from the bench.Israeli man, receives kidney from daughter who died in accidentJERUSALEM A 66-year-old Israeli man received a Moshe Shimnoni came out of surgery on Tuesday, Oct. 17, as his daughter, Orit Gur, 44, was being buried Yediot Acharonot reported. liver were transplanted into other patients. Gur had signed an organ donor card several years ago, according to reports. something happened to one of us, wed donate our organs, her husband, Lior, said in his eulogy, The Times of Israel giving life to other people. The couple have two children, aged 20 and 16. Alon Day (L-R) Lightning captain Steven Stamkos, Community hero Carl Glassberg and team owner Jeff Vinik. PAGE 2 JEWISH PRESS of PINELLAS COUNTY OCTOBER 20 NOVEMBER 2, 2017 The Jewish Press assumes no responsibility for the opinions of columnists, letter writers, claims of advertisers, nor does the paper guarantee the kashruth of products & services advertised or mentioned otherwise. P.O. BOX 6970, CLEARWATER, FL 33758-6970(6416 Central Ave., St. Petersburg, FL 33707)T elephone: (727) 535-4400 Fax: (727) 440-6037 E -mail: jewishpress@aol.comThe Jewish Press is mailed STANDARD CLASS. Standard Class DOES NOT include a speedy delivery guarantee. Date of delivery varies depending on your Standard Class Postage Permit: TA MP A PI #3763The Jewish Press of Pinellas County is a privately owned, community newspaper published in cooperation with the Jewish Federation of Pinellas & Pasco Counties. The Federation underwrites home Pinellas County (approx.4,500), to promote Jewish community cohesiveness and identity.The Jewish Press is a subscriber to JTA, The Global Jewish News Source.JIM DAWKINSPublisher & Co-OwnerKAREN DAWKINSManaging Editor & Co-Owner Advertising Sales GARY POLIN TORI GEE GALE TARNOFSKY-ABERCROMBIE Staff Writer & Editor BOB FRYER Ad Design & Graphics REY VILLALBA DAVID HERSHMAN Social Columnist JUDY LUDIN Editorial Assistant GAIL WISEBERGPUBLIC AT ION & DEADLINE D ATE SAlso publisher of the Jewish Press of Tampa of PINELLAS COUNTY An independent, bi-weekly newspaper owned by THE JEWISH PRESS GROUP of TAMPA BAY, INC. www.jewishpresspinellas.com STAFF THE FEDERATION MAINTAINS THE MAIL ING LIST FOR THE JEWISH PRESS.To RECEIVE THE PAPER or for ADDRESS CHANGES, Call (727) 530-3223 Go to info@jewishpinellas.orgNOVEMBE R 3Press Release .........Oct 20 Advertising ..............Oct 24NOVEMBE R 17Press Release ..........Nov 3 Advertising ...............Nov 7DECEMBE R 1Hanukkah editionPress Release ........Nov 17 Advertising .............Nov 21 Theres more than one way t o a nswer the call. l. Not a f an o f the phone? We hear you. You don t hav e to pick up to donate on Super Sunday. Its y our c all. Sunday, October 29, 2017 9:00a-1:00p Generously Hosted By: Superior Uniform Group 10055 Seminole Blvd Seminole, FL 33772 Not just a tel-a-thon! Join us for Kosher Food Lots of Fun PJ Library Arts & Crafts Teen Service Project And More! 4 w ays t o give T ext T ext T I m is s ed the call to 727-692-1992 S top b y ou r co mm u n it y w ide fu n draising eve n t Go olds chool a n d pick u pick u pick p t h e pho n e Give online at jewi s hfede r atio n s.o r g Sign up by emailing Diana at dmorin@jewishpinellas.org or calling 727-333-3104. 12 4 Oct 26 3rd Annual Mega Challah BakeOct 28 Catalyst 2018: An Evening with Ben & Jerry Oct 29 Federations Super SundayNov 8 Menorah Manor Annual MeetingNov 9 Gulf Coasts Annual Faces GalaNov 9 Kristallnacht Commemoration at Florida Holocaust MuseumDec 3 CBI Chase the Dreidel 5KDec 12 Chabad of Clearwater Chanukah ExtravaganzaDec 17 PJ Library Teddy Bear TeaDec 24 Young Adult Division Vodka LatkeJan 27-29 TBE Art FestivalFeb 10 Florida Holocaust Museums Annual To Life Gala Feb 25 TBI Food Festival & Purim Carnival Mar 11 CBI Chaivana Nights GalaMar 24 Gulf Coast Golf Like a Rock StarApr 15 Jewish Heritage Festival Israel@70Apr 29 Sonya Miller Women of Distinction The Jewish FederationOF PINELLAS & PASCO COUNTIES, FL October 28th, 2017 CENTRAL PARK PERFORMING ARTS CENTER rff 7 pm: VIP Cocktail Reception ntb 8 pm: Program nb tfbbbb LOUIS ORLOFF PHILANTHROPIC FUND AT TOP JEWISH FOUNDATIONdouble scoop sponsor double scoop sponsor Demographic Study ResultsEarlier this year, 550 households participated in a study on our Jewish community. Join us to learn about the fascinating results! Sunday, November 5 10a 12p South County Presentation 4 6p North County Presentation Monday, November 6 9 11a North County Presentation 7 9p South County Presentation Please visit www.jewishpinellas.org for full details. Chabad of ClearwaterTorah and tea: Rebbetzin Miriam Hodakov leads a Torah and Tea exclusively for women on Wednesdays at 11:15 a.m. There is no charge to attend. RSVP to MiriamHodakov@gmail.com or Temple Beth-El St. PetersburgCamp Coleman talk: Learn about summer camp at Camp Coleman during an informational meeting on Sunday, Oct. 29 at 9:30 a.m. in the all-purpose room. Camping weekend: The congregation will hold its annual camping trip on Friday through Campgrounds in Madeira Beach, 5400 95th St. N. This is an event for the whole family. Register at info@ templebeth-el.com. Brotherhood schmooze: Families are invited to hang out and relax while children attend religious school classes on Sundays from 9 a.m. to noon in the social hall. Enjoy a bagel and a cup of coffee and read the newspaper. Chabad of St. PetersburgHuman psyche explored: A 4-week course, Soul Maps, introduces participants to the Tanya, a 200-year-old text with a revolutionary look at human psychology. help people understand the source JEWISH PRESS of PINELLAS COUNTY OCTOBER 20 NOVEMBER 2, 2017 Congregations Lenny s Lenny s 21220 U.S. 19 NorthJust south of Drew St. and north of S.R. 60727.799.0402Curing hunger...one meal at a time for 30+ yearsHome of the almighty danish basket!Best Breakfast in Clearwater! s Serving Breakfast & Lunch Anytime 6am 3pm ~ 7 days a week Jewish-style deli & much more! 2... 4... 6... 8... Who do we appreciate for more than 3 decades! ing joy, purpose and direction. The course begins on Monday, Oct. 30 at 7 p.m. and will continue Mondays through Nov. 27. Cost is $36 per person for all four weeks. com or call Chabad. TGI Shabbat: There will be melody and song, conversation and just the right amount of Torah, dur3 at 6:30 p.m. There is no charge but reservations are appreciated. To RSVP, email info@chabadsp. com Kids Havdalah party: Light up family game night with a Havdalah ceremony and rocket balloon light show on Saturday, Those attending can make gourmet popular games with a Jewish twist. There is no charge but reservations are appreciated. To RSVP, email or call the Chabad center. Lunch and Learn: Women are invited to share an hour of LIGHTNINGpicture taken with Jeff Vinik and Steven Stamkos andreceiving a Lightning jersey even though it was too big. A retired accounting executive, Glassberg will be honored again Community Services Community Volunteer of the year on Thursday, Nov. 9 at Faces, the social service His generosity and his oversight of Program will be recognized alongside others who have overcome hardships with the help of Gulf Coast programs. Glassberg was born in 1930 and grew up in Manchester, NH. His grandparents owned a furniture manufacturing business where his father worked as sales manager. Glassberg studied mathematics and economics at Dartmouth and continued with graduate studies in accounting at the Tuck School of Business. He earned a law degree from Fordham University and countant. That led to a partnership at Peat, Marwick and Mitchell, a prestigious accounting firm headquartered in New York. He committee of the tax division of Public Accountants. sion helping those who survived the Holocaust and the love of his and he heard her life story: Poland, in 1930. At the age of 9, ported to Auschwitz by train. A faulty mechanism in the gas chamber prevented the Nazis from exdeath camp in Austria. Once again, Nazi plans to exterminate the prisoners were foiled when Gen. George Patton liberated the camp on the last day of the war. She somehow managed to be She was not a typical survivor. She would speak to other survivors and always wanted to help them. an interest in meeting other survivors. Those who have survived the by spending time with others who went through similar experiences. hances their quality of life and provides the emotional strength necessary to stay positive. groups and Carl quickly was tapped Survivor Program Advisory Comthe Holocaust Survivor Program offers assistance with victim restitution, homecare so survivors can remain in their own homes as long as possible, and emergency funds for low-income clients to help cover costs of medicine, food, transportation and other essential services. ago, the United States Holocaust Museum in Washington, D.C. honored her contributions to survivors over the years. For his part, Carl remains a member of Holocaust Survivor Program Advisory Committee among his many volunteer efforts through the years to make life better for Holocaust survivors, whether helping them with their income tax calculations or volunteering at the Florida Holocaust Museum. He recently assisted in raising funds that helped meet the needs of 60 Holocaust survivors who live on income considered below poverty level. With this funding, Gulf Coast JFCS could provide hearing aids, glasses, emergency medical and pharmacy expenses, and dental care for the survivors. To Glassberg, the best part of receiving the Lightning Hero award was bringing more awareness to the fact a lot of survivors remain and He never misses an opportunity to point out the need for funds. As Holocaust survivors age, their needs grow and expenses increase. Our goal is to make sure survivors live out their lives in peace and with dignity. Never again should they worry about their next meal. said said Dr. Sandra Braham, Gulf Services CEO. He inspires us with his enthusiasm, and holds us accountable with his high standards. The Faces gala will be held at the Hilton St. Petersburg Carillon Park, on Nov. 9, beginning at 6 p.m. with a welcome reception followed by dinner and the program honoring Glassberg and three other program For more information and to RSVP, go to www.gcjfcs.org/ faces2017. Floral Design Studio 6700 Central Ave., St. Petersburg local and worldwide delivery Weddings Events Bar/Bat Mitzvahs Redman Steele 727.343.1020 RedmanSteeleFlorist.net camaraderie, inspiration and lunch at a Lunch and Learn session on Thursday, Nov. 16 at noon. There is appreciated but not necessary. To RSVP, email Chaya@ChabadSP. com or call the Chabad center.Temple Ahavat Shalom Palm Harbor Temple Committee will present a talk on Chief of Police Tony Holloway on Thursday, Oct. 26 at 7 p.m., at the temple. .No RSVP is required. JCC of West Pasco Port RicheyAdult education: A class to Jewish life in the 21st century will be offered on Sundays from 10 11 a.m. The class is free, but donations are welcome. JEWISH PRESS of PINELLAS COUNTY PAGE 7 OCTOBER 20 NOVEMBER 2, 2017 MJCCA | 5342 Tilly Mill Road, Dunwoody, GA 30338 | 678.812.3844 | /CampBarneyMedintz | campbarney.org Shades, blinds, draperies Hunter Douglas window fashions Complimentary in-home design consultation Installation Shade and blind repair services Window covering motorization Mon. Fri. 9 a.m. 5 p.m. ~ Sat. 10 a.m. 4 p.m.2610 4th Street North, St. Petersburgwww.blindandshuttergallery.com Quality Treatment for You and Your Windows. Quality Treatment for You and Your Windows. 727.823.2929Raising children in the age of the internet and smart phones can be a challenge, and many parents struggle to understand the effects of this technology and how to set limgeneration to be raised since the invention felt everywhere. To better understand the issues involved, and older and their parents to a free showScreenagers: Growing Up in the Digital Age on Tuesday, Nov. 14. Light refreshments will be offered at 6 p.m. at the school, 2020 W. Fletcher Ave., Tampa. The movie will be shown next door at Congregation Beth Am at 6:30 p.m. The evening will also include a discussion session, with parents and youths invited to participate. This event was originally scheduled for Sept. 12, but was postponed due to Hurricane Irma. Hillel sixth grader David Caine is a typical technological teen, able to juggle more than one tech device at a time. Hillel to present lm, discussion on raising children in digital age Reservations are required by registering by-hillel-academy-of-tampa-3801. For more information, call Cosmo Kunzelmann at (813) 963-2242. The community is invited to hear Rabbi Leor Sinai, co-executive director of Alexander Muss High School in Israel, speak on how teenagers and their families should prepare to respond to anti-Israel and anti-Semitic rhetoric. All Jewish teens are strongly encouraged to participate in this free, casual, interactive program. The program will be held on Tuesday, Nov.7 at 7 p.m. at Congregation Bnai Israel, 300 58th St. N., St. Petersburg. The event is sponsored by Jewish National Fund. Rabbi Sinai will speak on why it is critical for youths to be educated and grounded with a strong Jewish and pro-Israel background. Originally from New York, Rabbi Sinai made aliyah, moving with his family to Israel in June 2011. He began his tenure as co-executive director at the international Alexander Muss High School two years later. As a young adult, he was involved in New York Citys night life as a club producer and MC (Master of Ceremonies), but in 1995 that all changed while he spent the academic year abroad studying at Haifa University. On his return, he completed his bachelors degree in Jewish Studies at New Yorks Hunter College and continued his education at the Jewish Theological Seminary of America, receiving ordination and a masters in Hebrew Letters in 2009. Israeli educator to speak on anti-Semitic rhetoricRabbi Leor Sinai HILLELONTINUED from FRONT PAGEto working with other local organizations to make Hillel Academy the premier institution of Jewish life and learning in the Tampa Bay region. Oakes, whose three children will attend Hillel Academy, is a graduate of the Akiba Hebrew Academy in Philadelphia and has a masters degree in education from the University of Florida. After extensive consideration, we have elected a very special person with whom to partner in the adventure to prepare our children for a future world that has not yet even been envisioned, said Solomon. Her vision and enthusiasm will enable Hillel Academy to reach new heights in innovative learning and Jewish living, said Sandy Solomon, president of the board of trustees. The board is certain Oakes will be a valuable partner and participant in Tampas Jewish community, as the school continues to pursue excellence on every front. nationwide were considered for the leadership position, with guidance from the top When Oakes joins Hillel Academy, she ing and cultivating bonds with students, faculty, staff, parents, and community leaders. every component of the school to facilitate the development of short-term and longrange plans to promote its journey onward and upward. With about 200 students in transitional kindergarten through eighth grade, Hillel Academy is the only accredited Jewish Day School in the Tampa Bay area. It offers both Judaic and general academic studies. The school is located at 2020 W. Fletcher Ave. in Tampa. For more information, go to www. hillelacademytampa.com or call (813) 9632242. PAGE 8 JEWISH PRESS of PINELLAS COUNTY OCTOBER 20 NOVEMBER 2, 2017 This musical, set in 1970, opens at the last day of sitting Shiva for Sam Silvers beloved wife. The show explores love, loss and nding a reason to live again.November 2-12Catherine Hickman Theater 26th Ave. S. & Beach Blvd, Gulfport Thur-Fri-Sat @8PM Sat & Sun @2PMTickets$18 online at www.GulfportCommunityPlayers.org $20 at the door (cash only) This musical, set in 1970, opens at the last day of sitting Shiva for Sam Silvers presents the world premiere of an original musical by Gil Perlroth TAKE OUT ORDERS(727) 391-8393BEAUTIFUL LAKESIDE DINING OPEN YEAR ROUND 7 DAYS A WEEKPARK PLACE CENTER 9015 PARK BLVD. SEMINOLE(1 1/2 BLOCKS WEST OF STARKEY)NEW YORK (JTA) The Conservative movement will maintain its ban on rabbis performing interfaith marriages while seeking to welcome couples who are already intermarried, according to a new letter signed by the movements four leaders. The letter addressed to the movements clergy, educators and leaders, follows a summer when a few prominent Conservative rabbis announced that they would begin officiating at intermarriages. It does not represent a change in the movements policy or practice of Jewish law. We affirm the traditional practice of reserving rabbinic officiation to two Jews, the letter reads. But the movements leaders continued they are equally adamant that our clergy and communities go out of their way to create multiple opportunities for deep and caring relationships between the couple and the rabbi, the couple and the community, all in the context of welcome and love that extends well before the moment of the wedding and well beyond it too. The letter was written by Rabbi Bradley Artson, dean of the Ziegler School of Rabbinic Studies in Los Angeles, and co-signed by Arnold Eisen, the chancellor of the Jewish Theological Seminary; Rabbi Julie Schonfeld, CEO of the Conservative Rabbinical Seminary; and Rabbi Steven Wernick, CEO of the United Synagogue of Conservative Judaism. Since 2000, more than 70 percent of non-Orthodox Jews have married non-Jewish partners, according to the Pew Research Centers 2013 study of American Jewry. The other major Jewish denominations in the United States are split on the issue: the Reform movement allows intermarriage and the Orthodox prohibits it. Conservative Judaism aims to maintain fealty to traditional Jewish law while remaining relevant to the modern world. Its rabbis or attending intermarriages, but recently the movement has taken steps to welcome intermarried couples both before and after the wedding. This year, the movements synagogues voted to allow non-Jews as members. But several of the movements intermarriages, arguing that the movement has not gone far enough in embracing the spouses of many young Jews. Last December, Rabbi Seymour Rosenbloom of Philadelphia was expelled from the Rabbinical Assembly umbrella group for performing intermarriages. In June, the Conservative-or dained clergy at Bnai Jeshurun, New York synagogue, announced that they would begin perform ing intermarriages. So did Rabbi Amichai Lau-Lavie, who heads the experimental congregation Lab/ Shul in New York. Conservative leaders responded opposition to intermarriage while pledging to respect and welcome intermarried couples. The new letter echoes that sentiment. We all know that intermarriage is a loving choice people make in an open and accepting society, Rabbi Wernick told JTA. As rabbis and leaders, we also have a commitment to Jewish law and Jewish marriage. How do we create a language that acknowledges both of these realities as well as a commitment to welcome those Jews and families to journey Jewishly on this path?Conservative movement reafrms intermarriage ban, but urges communities to welcome couplesBy PENNY SCHWARTZ JTA news serviceBOSTON If New England Patriots star Julian Edelman retires from the NFL anytime soon, he clearly has a promising second career as a Jewish childrens book writer. In front of about 400 children and their families at Center of Greater Boston, the 31-year-old wide receiver and Super Bowl hero read a special edition of a childrens book he co-wrote last year. Unsurprisingly Edelman, who has Jewish ancestry recent years, was treated like a rock star. Hes a really good receiver and I hope I like his book, Ilan Sherman Kadish, one of Edelmans many young fans in attendance, said before the player spoke. The event was organized by PJ Library, the Massachusetts-based global Jewish childrens book giveaway program supported by the Harold Grinspoon Foundation in partnership with other philanthropists and local Jewish community organizations. Flying High, a semi-autobiographical story about an endearing squirrel named Jules who is determined to play football, were mailed this month to 5-year-olds in Jewish homes across North America through the PJ Library program. Before Edelman read his book, the audience was shown a video with footage from his visit to Israel in 2015 (which was co-sponsored by the Combined Jewish Philanthropies of Greater Boston). The crowd cheered loudly after the video as Edelman, wearing a brace from a preseason knee injury that has kept him from playing this season, made his way onto the stage. Edelman said onstage that the story of Israel reminded him of his own struggles to push past those who overlooked him. He was picked in the seventh was not projected to succeed in the league. But he has notched over 400 career receptions, helped the team win two Super Bowls and become quarterback Tom Bradys favorite target. I fell in love with the people of Israel, Edelman said, noting his admiration for how the small country thrives despite being surrounded by unfriendly countries. Its a theme he said he wanted to convey in a childrens book, especially after the birth of his daughter, Lily, last November, to whom he dedicated the book. The new PJ Library edition of Flying High includes emphasizes the storys Jewish content and values. Julian Edelmans childrens book gets a Jewish makeover photo by Etan Harmelech/Harold Grinspoon FoundationOne lucky fan had a fun encounter with Julian Edelman at a private reading of his book at the JCC of Greater Boston before the main event, Oct. 10, 2017.There is also a new reference to Theodor Herzl, the founder of modern Zionism. The dedication page includes one of Herzls most famous quotes: If you will it, it is no dream. The quote shows up in illustrations throughout the story as its young squirrel protagonist trains hard and perseveres against his detractors a group of animals that includes an eagle, a buffalo and a bear who ridicule him for being too weak, slow and small. The idea for the quote came from the Israeli-born Assaf Swissa, Edelmans co-author. Edelman told JTA after the event that while the quote was not central to Herzl quote. A second Flying High book is due out in time for Hanukkah, Swissa told JTA. Edelman has become an object of Jewish member of the tribe in a 2013 interview on the NFL Network. He has tweeted about Jewish holidays, wore an Israel pin during a game in 2014 and was named one of the best Jewish football players of all time by the American Jewish Historical Society last year. PJ Librarys founder, Jewish businessman Harold Grinspoon, and his wife, Diane Troderman, both philanthropists, attended the event with Edelman along with their grandchildren and other members of their family. Edelman is an amazing guy. Hes a heimische guy. Hes so real, Grinspoon told JTA, using a Yiddish term meaning friendly and down to earth. I love the [Flying High] story because its so true to who he is. JEWISH PRESS of PINELLAS COUNTY PAGE 9 OCTOBER 20 NOVEMBER 2, 2017 727.789.2000 dwd tyb hrwbq tyb A Sacred Trust Michael, Mandi, David, Pati and Steven GrossDAVID C. GROSSFUNERAL HOMES 6366 Central Avenue St. Petersburg Fl 33707(727) 381-4911Reform Conservative OrthodoxGeneration to Generation, our reputation for superior service and fair pricing has made us the areas most often chosen Jewish funeral provider.THE JEWISH FUNERAL HOMES OF PINELLAS & PASCO COUNTIES830 N. Belcher Road Clearwater, Fl 33765 Michael, Mandi, David, Pati and Steven Gross Obituaries 12905 Wild Acres Rd. Largo, FL 33773 Serving the Pinellas County Jewish Community since 1968The Jewish Burial Society of Pinellas County Inc. dba Chapel Hill Memorial Park is a 501 (c) (3) non-prot corporation licensed by the State of Florida Tina Solomon Kronenfeld, art educator and historian, will present New York! New York! Jewish artists in the Big Apple (1949-2000) on Wednesday, Nov. 15 from 7-9 p.m. as a program sponsored by the St. Petersburg Chapter of Hadassah. The program, which provides an overview on how New York became the worlds center for art, will be presented at Congregation Bnai Israel, 300 58th St., N., St. Petersburg. This event is open to the public. A lover of art since childhood, Solomon Kronenfeld received her BA in art education from the University of Maryland and a master of visual arts from Georgia State University. She taught at various high schools throughout DeKalb County, GA, reer at the historic Druid Hills High School home of Jewish playwright Alfred Uhry and NY Yankees player Ron Blomberg. The school also served as backdrop for the classic movie Remember the Titans. reer, Solomon Kronenfeld said, One of the things I am most proud of is the fact that many of my for mer students became art educators or artists, including Kara Walker, renowned artist and recipient of the MacArthur Genius Grant. To RSVP, call or email Renee Lipman at (727) 698-0171 or renee@lipman.net.Hadassah speaker to focus on 20th century NYC Jewish artists Tina Solomon Kronenfeld PAMELA S. BARRON 62, of New Port Richey, died Oct. 10. She was born in Boston and worked for many years as an employment recruiter. (David C. Gross Funeral Homes, Clearwater Chapel) JOEL S. PRAWER, MD, 66, of St. Petersburg, died Oct. 11. He was born in St. Paul, MN, and was a family physician at Point Brittany Medical Center for 35 years. He earned his medical degree at the University of Minnesota and completed a three-year Family Practice residency at Bayfront Medical Center, where he continued to teach since his graduation. In June, he was awarded the outstanding preceptor award. His son, Adam, joined him in practice in 2012. Survivors include his wife of 37 years, Cathy; son and daughter-in-law Adam and Catie Prawer; daughter and son-in-law Sarah and Ryan Lipton; brother and sisterin-law, Kenneth and Bonnie Prawer; mother-in-law Marie Herman; sisterin-law and brother-in-law, Brenda and Gerry Krug; two grandchildren. The family suggests memorials to Suncoast Hospice. (David C. Gross Funeral Homes, St. Petersburg Chapel) ROY S. SIEGLE, 96, of St. Pete Beach, died Oct. 8. Born in Philadelphia, he was a veteran of World Army Air Corps. He was a recipient of a Purple Heart and was honored by the French Foreign Service. He served as a 30-year board member of the Menorah Manor Foundation, holding positions as vice chair, treasurer, secretary and trustee. Survivors include his son, James Siegle (Michael Crawford); sisters-in-law, Margie Slott and Ellyn Mullin. The family suggests memorials to the Menorah Manor Foundation. (David C. Gross Funeral Homes, St. Petersburg Chapel)By BEN SALES JTA news serviceMark Zuckerberg wrote last December on Facebook that for him, religion is very important. Looks like he meant it. The Facebook co-founder has been invoking Judaism a lot lately. In May, he quoted a Jewish prayer at Harvards commencement. A few weeks ago he posted a picture of his daughter with a family kiddush cup. And on Saturday night, Sept. 30, he posted a public apology at the end of Yom Kippur. Although he was a member of the Jewish fraternity AEPi before he dropped out of Harvard, Zuckerberg didnt discuss his Judaism much before 2015. Replying to a comment last year, Zuckerberg wrote that he went through a period where I questioned things, but now I believe religion is very important. began nearly two years ago following then-presidential candidate Donald Trumps call for a ban on Muslims entering the United States. Being raised as a Jew, Zuckerberg wrote, made him sensitive to attacks on all minorities. After the Paris attacks and hate this week, I can only imagine the fear Muslims feel that they will be persecuted for the actions of others, Zuckerberg wrote, referring to that years terror attack in the French capital. As a Jew, my parents taught me that we must stand up against attacks on all communities. Even if an attack isnt against you today, in time attacks on freedom for anyone will hurt everyone. Zuckerberg invoked his Judaism again after the August white supremacist rally in Charlottesville. Its a disgrace that we still need to say that neoNazis and white supremacists are wrong as if this is somehow not obvious, he wrote. case, shouldnt we? ), Zuckerberg has reconnected a person and a father. His post featuring a collage of a kiddush cup, Shabbat candlesticks and homemade challah waxed about passing the cup from generation to generation. For shabbat tonight, we gave Max a kiddush cup that has been in our family for almost 100 years, he wrote, referring to his eldest daughter who turns 2 in December. (The couple welcomed a second child in August). Her great-great-grandfather Max got it after our family immigrated here and it has been passed down through our family ever since. At the Harvard commencement, Zuckerberg told graduates that he sings an adaptation of the Mi Shebeirach the traditional Jewish prayer for the sick when he tucks her in at night. And it goes, May the source of strength, whos to make our lives a blessing, he told the graduates in May, quoting a version of the prayer by the late Jewish songwriter Debbie Friedman and lyricist Rabbi your life a blessing. While the moguls newfound piety may be attracting attention, he is doing what any young Jewish parCLAL-the National Jewish Center for Learning and Leadership. Plenty of Jews lose interest in their religion, then reconnect to it after having kids. There are a million people in his age cohort who are deeply proud of being Jewish and are trying to Photo by Paul Marotta/Getty ImagesMark Zuckerberg delivering a 2017 commencement speech at Harvard University in which he quoted the Mi Shebeirach prayer.How Mark Zuckerberg embraced his Judaism You marry and partner and have a family, and its not surprising that the questions of How do I have a more meaningful life and build a better future become more important and powerful and imminent. InterfaithFamily.com was especially pleased that Zuckerberg, whose wife, Priscilla Chan, is not Jewish, has posted about his familys Jewish rituals. ly are making Jewish choices for their family is the best news with which to start the new year, wrote Ed Case, founder of InterfaithFamily.com. Mark Zuckerberg and Priscilla Chan could really change the course of Jewish history if they got involved in efforts to engage interfaith families in Jewish life. Zuckerberg got Jewishly personal again when he asked for forgiveness at the end of Yom Kippur, the Jewish day of repentance. His critics might say he has a lot to atone for. During the 2016 presidential campaign, Facebook was accused of allowing Russian hackers to post also were allowed to target ads based on phrases like Jew hater and how to burn Jews. (Facebook COO Sheryl Sandberg, who also is Jewish, said the company would address the problem.) For those I hurt this year, I ask forgiveness and I will try to be better, he wrote Saturday night. For the ways my work was used to divide people rather than bring us together, I ask forgiveness and I will work to do better. tered trouble because of the content published on his lawsuit against Facebook for ignoring incitement to terrorism on the network and enabling terrorists to While Zuckerberg may not have always talked publicly about his Judaism, he has surrounded himself with people who do. His college roommate moved to Israel and became a Conservative rabbi. Sandberg has spoken frequently about how Jewish rituals helped her cope following her husbands untimely death in 2015. And his sister, Randi, is open about her Jewish observances. She says her family unplugs for a digital Shabbat each weekend, and sang Jerusalem of Gold, a classic Israeli song, at the Davos World Economic Forum. Zuckerberg, published in 2008. While he attended the forum that year, Israels delegation invited him to visit the country. He has yet to accept. But after giving his daughter a kiddush cup and atoning on Yom Kippur, maybe this is the year.